Halfway through the huge Social Sciences category, I arrived at books dealing with Public Administration & Military Science. This section had books with topics that include general considerations of public administration, specific fields of administration, public administration of economy & environment, foot forces & warfare, mounted forces & warfare, air and other specialized forces & warfare, engineering & related services, and sea forces & warfare. I am a military brat. My father served in the Air Force. My husband served in the Army. We’ve had family members in the armed services which probably date back to recorded time. Additionally one of my brothers served in the Army and the other brother was a Navy SEAL. My nephew is a marine. All branches of the armed services are represented in my family. I grew up around air force bases and played in old planes as a child. Being a child I took my environment for granted and though I was exposed to this world, I now realize that I know very little about it. Because of my background I found this section as fascinating as it is informative. to current and futuristic uniforms in 21st Century Soldier by Frank Vizard and Phil Scott, Popular Science. From all of the pictures it is interesting to note how the tools of a soldier are carried on or in addition to their uniforms which seem to have been gradually changing over time to the point where the uniform itself is becoming a major weapon and defense armor. There is one tool of a soldier that can not be given enough credit-soldier dogs. Dogs have been present in every US engagement and operation in some capacity since WWII (and probably before that). It was a military dog named Cairo working with Navy SEALS that took down Osama Bin Laden. The book Soldier Dogs by Maria Goodavage is a must read. Goodavage traces the involvement of working military dogs (WMD) in history and explains what it takes to make the cut as a WMD. There are both heart warming and heart wrenching dog stories included in this book in which handlers tell the stories of many unsung heroes. Continuing on from the Media Commons area, we arrive at the magazine and newspaper section. This is a long, double sided shelving unit. On the front facing shelves there are sample magazine covers. These are laminated and taped to the unit. 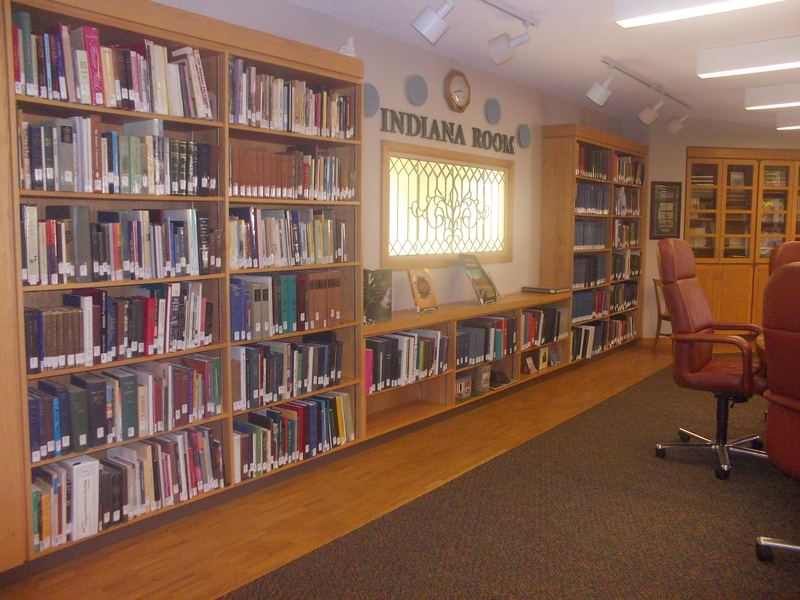 They are alphabetized to help patrons and staff find what they are looking for quickly. For example, let’s say I was a patron looking for the magazine Every Day with Rachel Ray. I would quickly locate the vicinity of magazines beginning with the letter E and then find the magazine I wanted. Once a patron finds the desired publication, the shelf is simply lifted revealing all the magazines of that particular title. 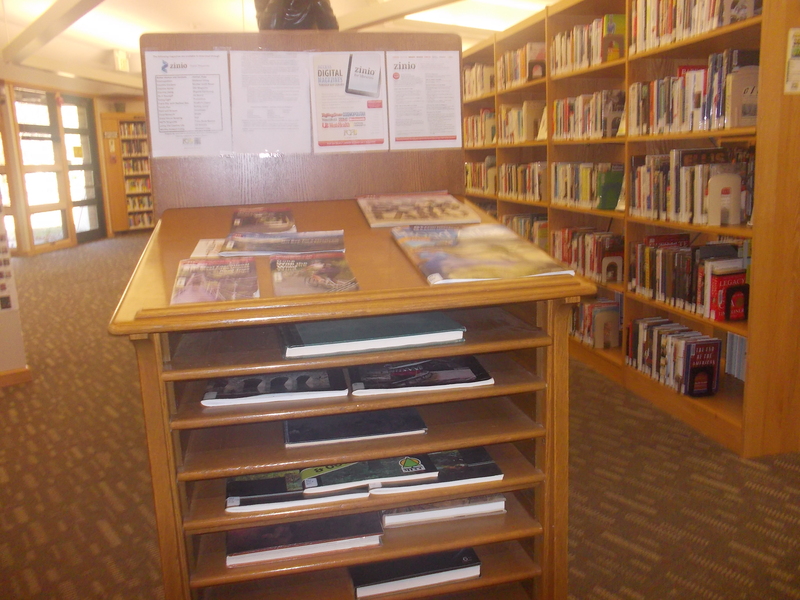 Here, the magazines are shelved by month making it easy to locate the most recent edition. 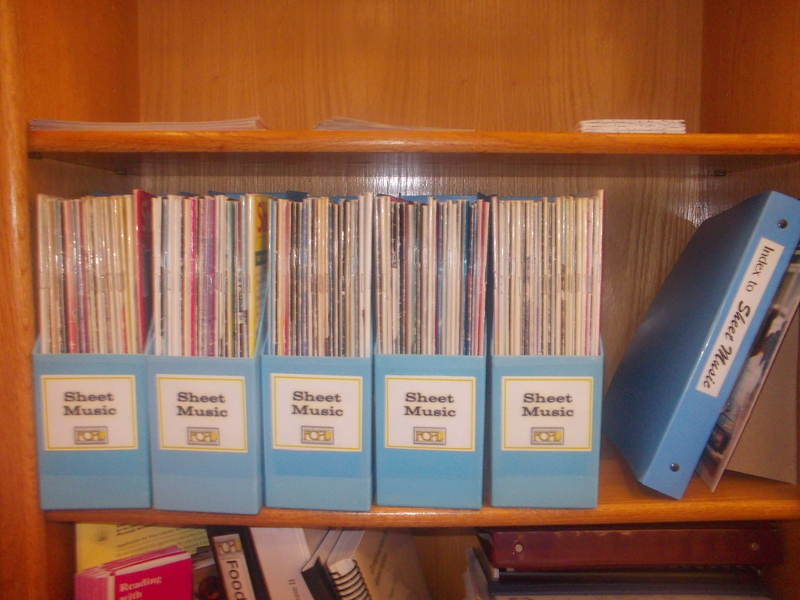 All of these magazines are barcoded and available for check out. As you can also see in the picture, this unit also houses newspapers. The most recent edition of the various newspapers will be visible with the most local news at the top. Again, the shelves can be lifted revealing back copies of the newspapers. The top of the magazine/newspaper unit also stores honor magazines. 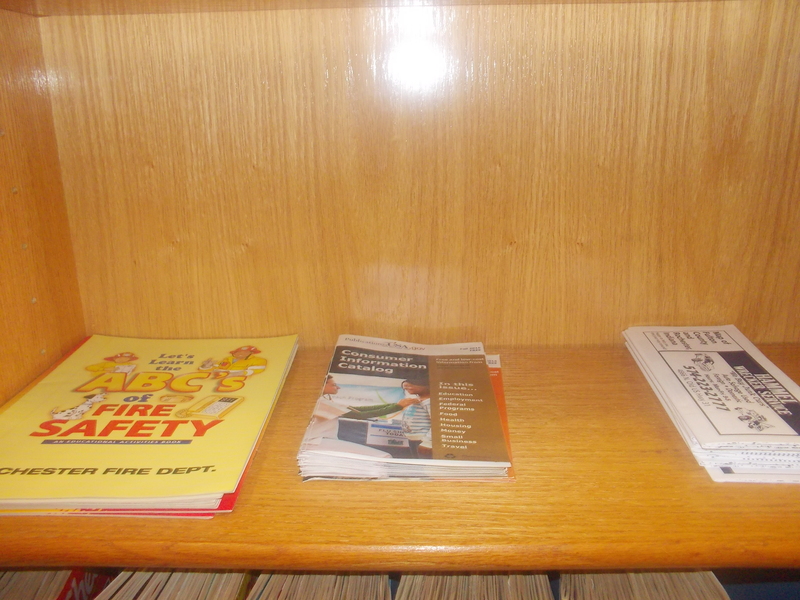 Some of the most popular ones, in this case quilting magazines, have been grouped together and put into binders. The honor magazines work just like the honor books previously discussed in another post. Honor magazines do not have to be checked out, but the circulation staff should be notified how many magazine binders are being taken. 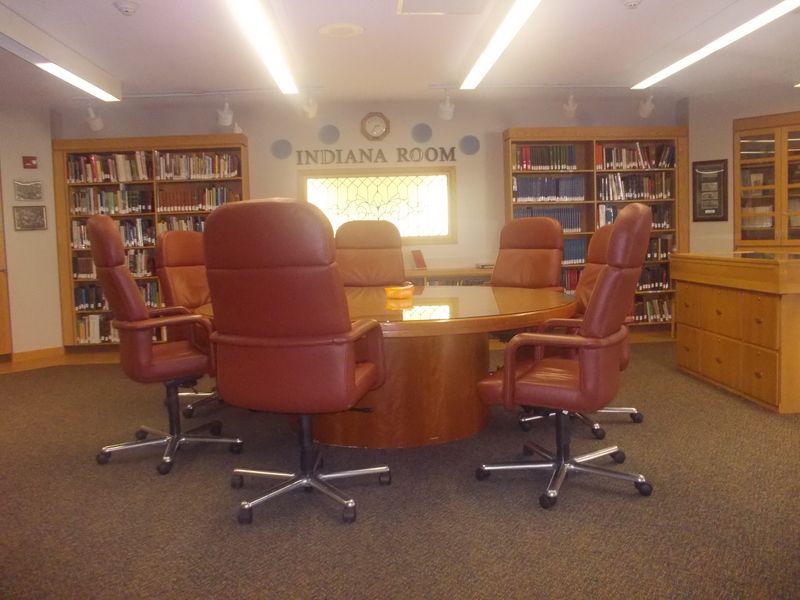 The library counts honor circs as “in house circulation.” Patrons are on the honor system to return the binders. 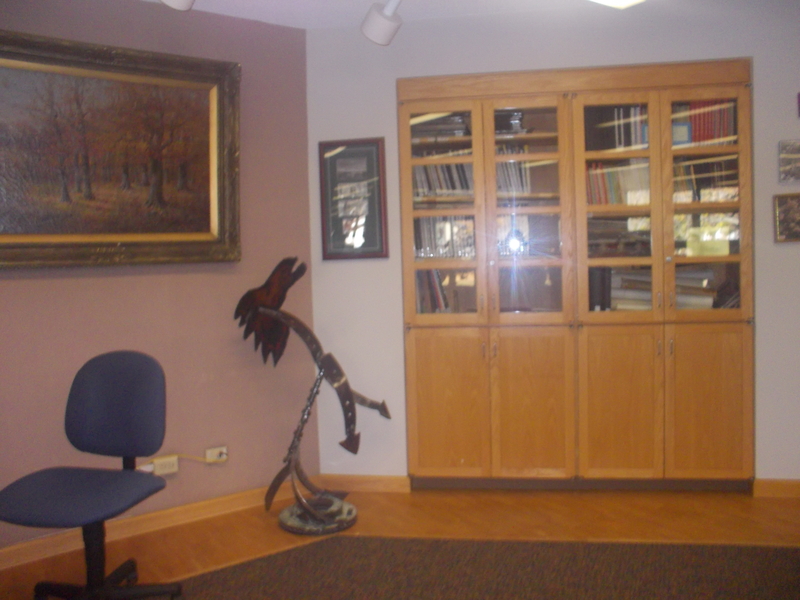 In keeping with the display of artwork throughout the library, the top of this unit also is home to a few sculptures. The first one depicts two people with open books. The second is a bronze sculpture called The Reading Girl which, if memory serves, was donated to the library. 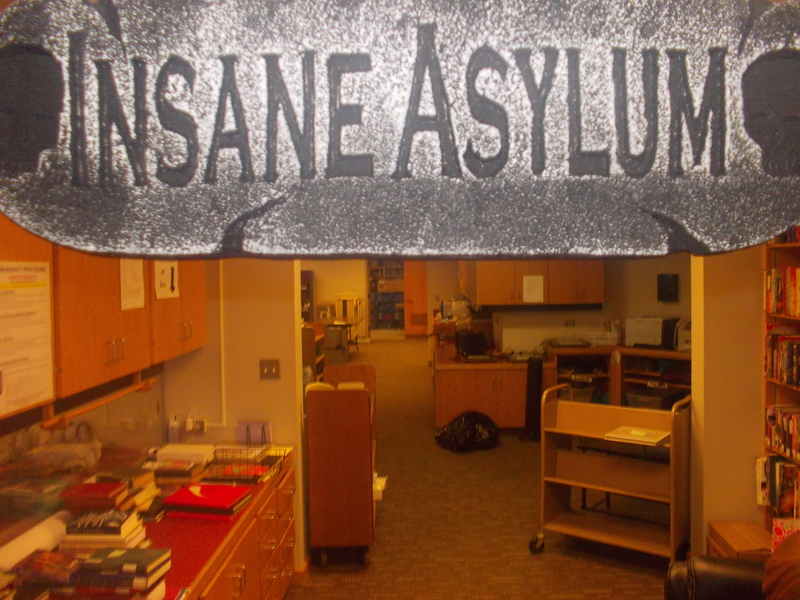 Here are a few more pieces on display on top of the magazine/newspaper unit. As part of my read through project, I have explored all of the magazines shown earlier and several papers. I tend to gravitate towards magazines that have plenty of pictures and deal with the broad topics of family, home, cooking, and crafting. There are many other magazines that cover a vast array of other interesting topics. 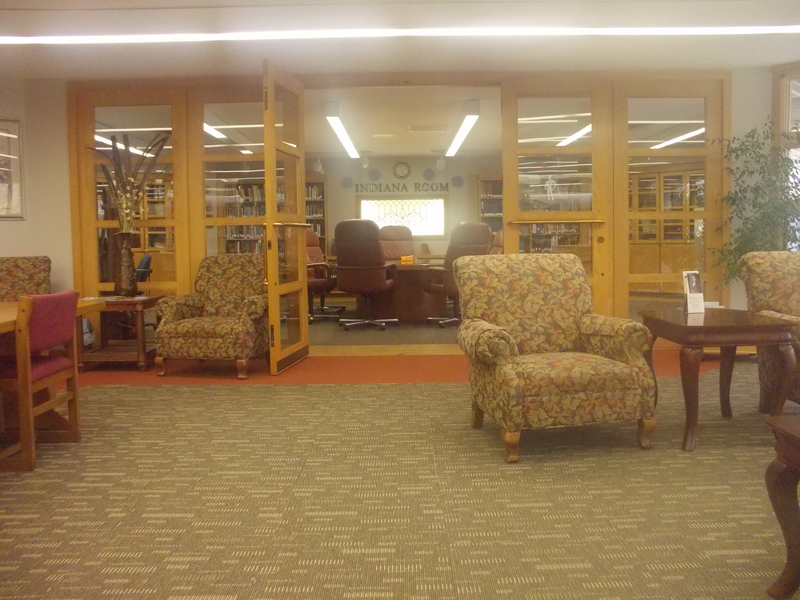 The magazine & newspaper collection at Fulton County Public Library has in itself probably saved me hundreds of dollars since I can read all of these magazines and newspapers for free instead of subscribing to the magazines and newspapers myself. This has also helped to reduce clutter in my home since I no longer have to store my own copies! 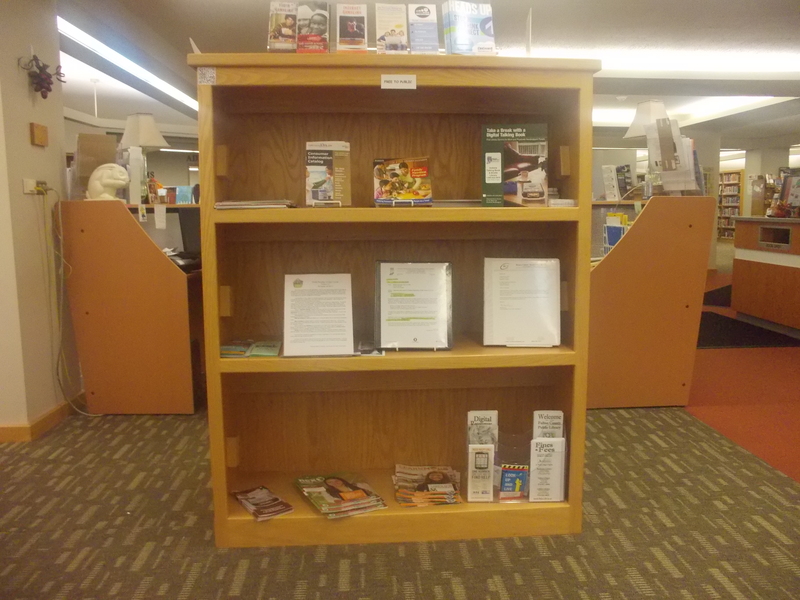 The Vertical Travel Section is located to the right of the Reference & Information window. 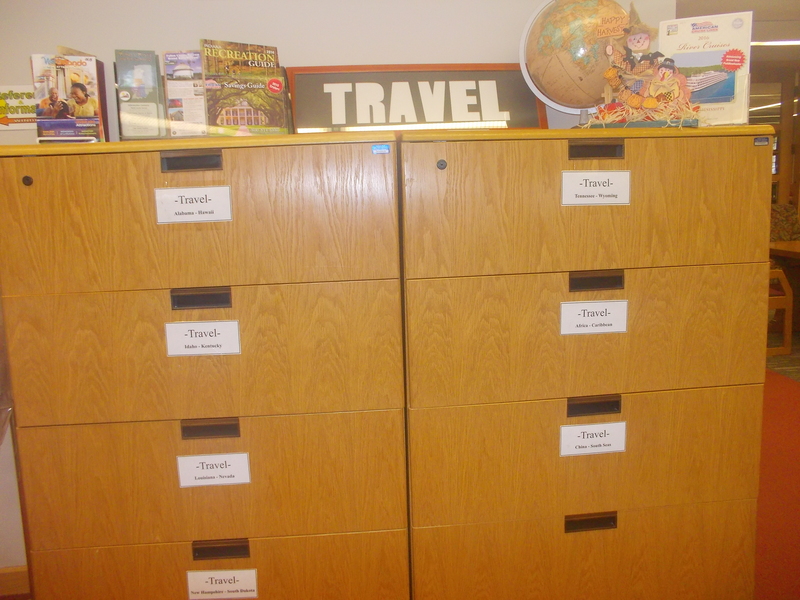 These file cabinets have brochures and some travel magazines organized alphabetically by state (Alabama-Wyoming) or by country (Africa-South Seas). 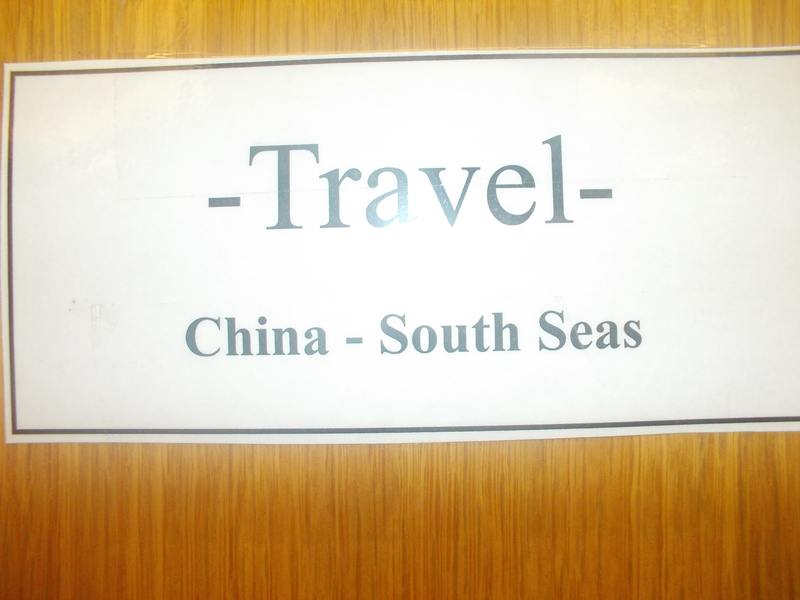 Each drawer is labeled according to the destination information it contains. 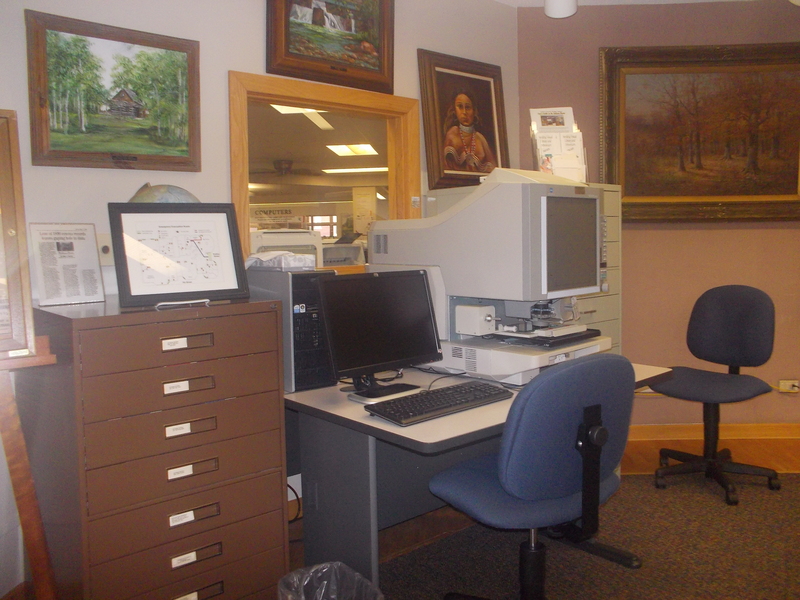 Patrons simply open the drawer they are interested and take out the content that they want to read. Everything in these file cabinets falls under the Honor collection. 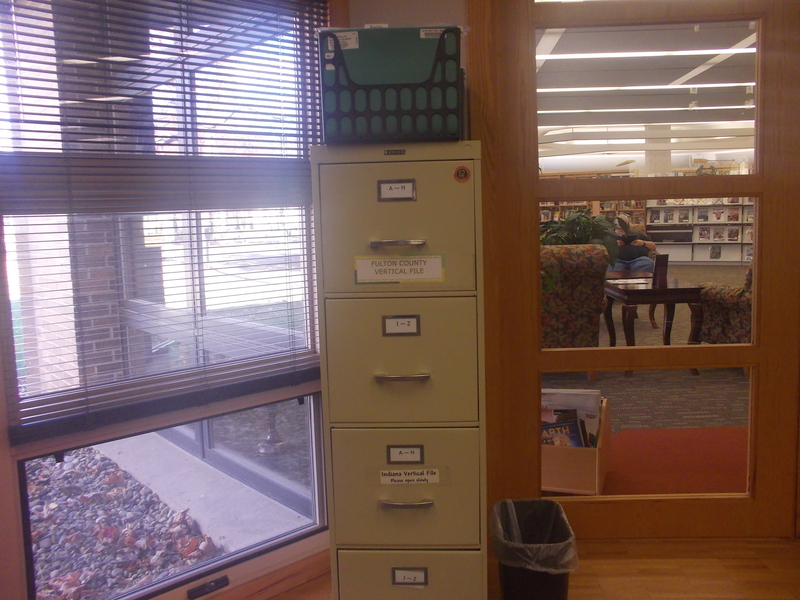 The materials in these drawers are not barcoded and do not have to be checked out with a library card. 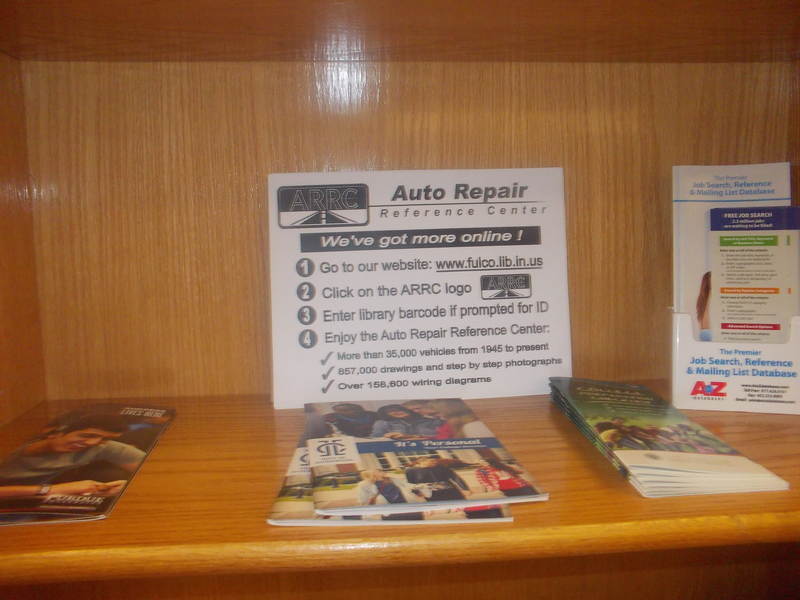 Just like the Honor books, patrons are requested to let the Adult Circulation desk know how many items they are taking. The library will record this material as “In House Circulation.” Patrons are on the honor system to return these materials. When I looked through this section, I was thrilled to find pictures and information about my husband’s small home town in North Dakota. I was impressed that there would be this much detail in these files. Near the vertical Travel Section is the Map Shelf. Some of the items on this unit are marked “Honor” and do not have to be checked out on a library card. The patron is requested to let Adult Circulation know how many of these items are being taken. Like the Honor books, patrons are on the honor system to return these materials. The items here that are not marked “Honor” are catalogued as Reference and must be used in the building. After use, either leave them on top of the shelf or on a nearby table. The staff will reshelve them. 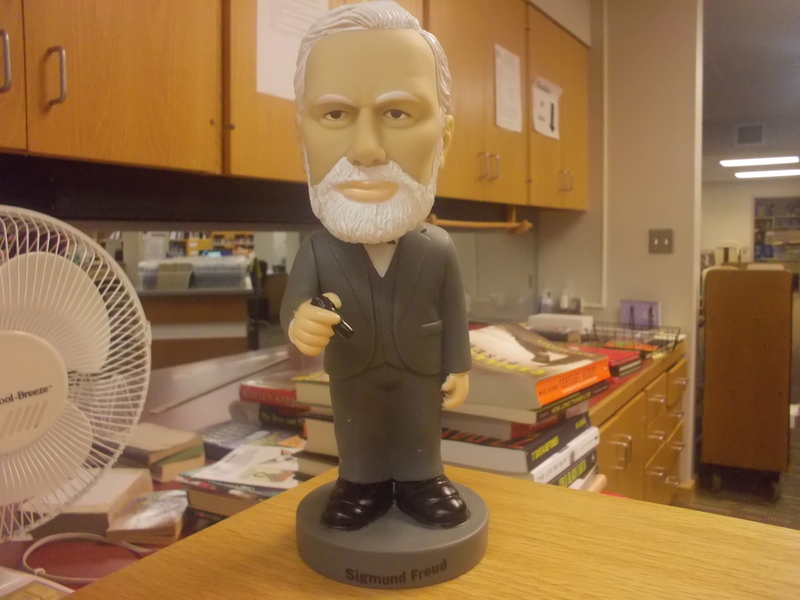 By leaving items out for the staff to reshelve, the library can better assess what materials are being used in the library and how often they are used. This shelf contains hardback and paperback books of maps. 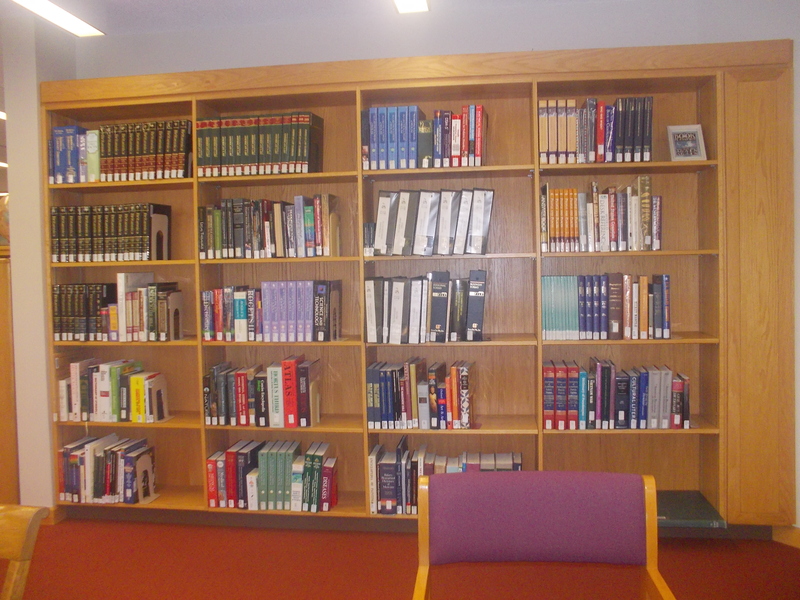 The individual shelves pull out for easier access. We have seen this bookshelf before, but from the other side. 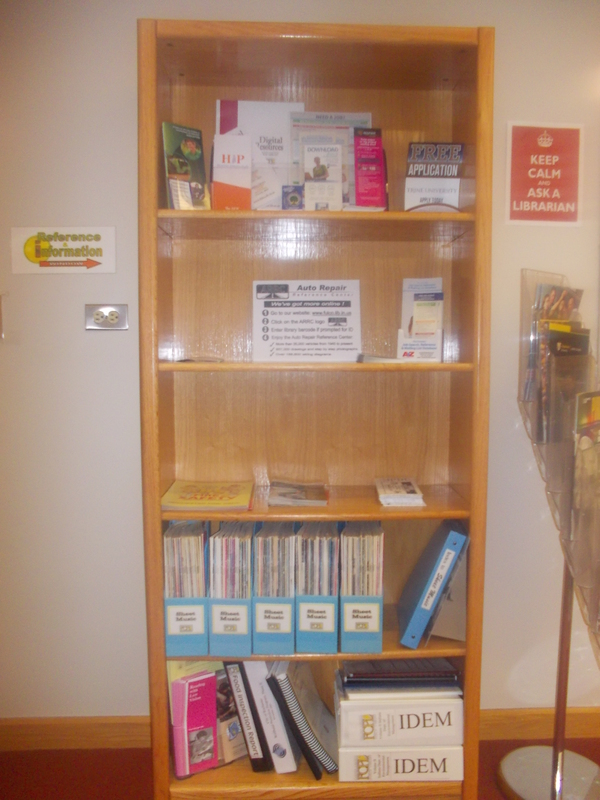 This bookshelf is located directly behind Grant Station and across from the map shelf. 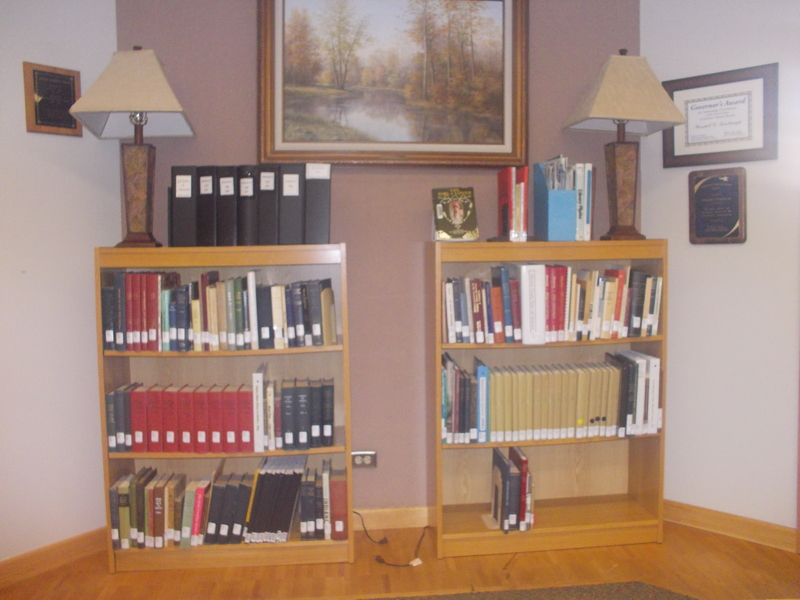 This shelf displays the most current legal notices and publications and also offers local and county maps that patrons may take and keep. Moving to the right brings us back to the Vertical Travel Section. 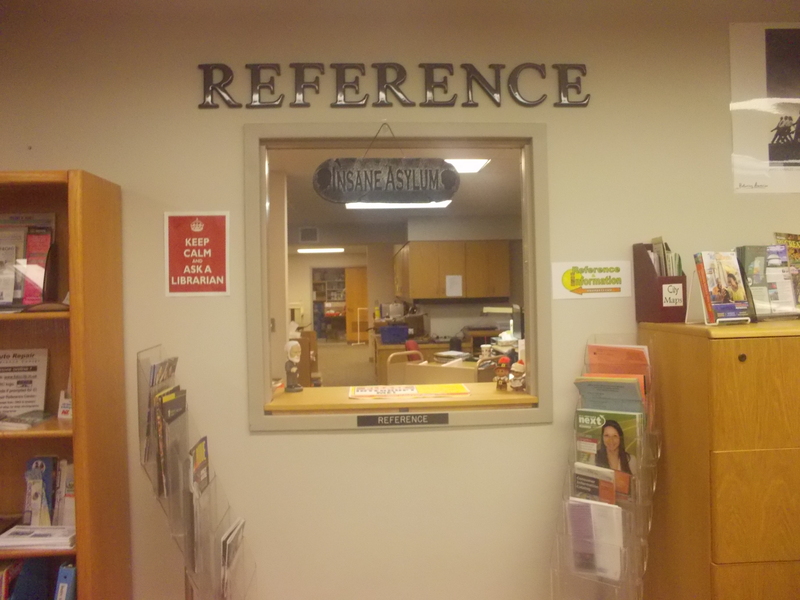 On the right side of this picture, the wall turns and brings us to a wall of reference books. 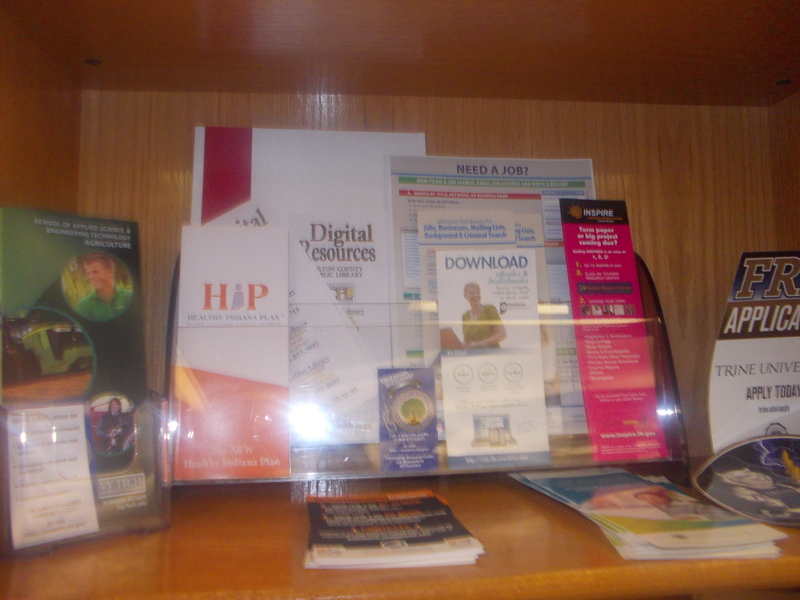 As you can probably tell from the picture, the Reference section for hard copy books is shrinking. This is due to the popularity and ease of computers and databases. Most databases are constantly updated with current information and users can usually locate information easier with the assistance of search engines. Many of the books on these shelves have some sort of historical significance and also include things like encyclopedias and dictionaries. 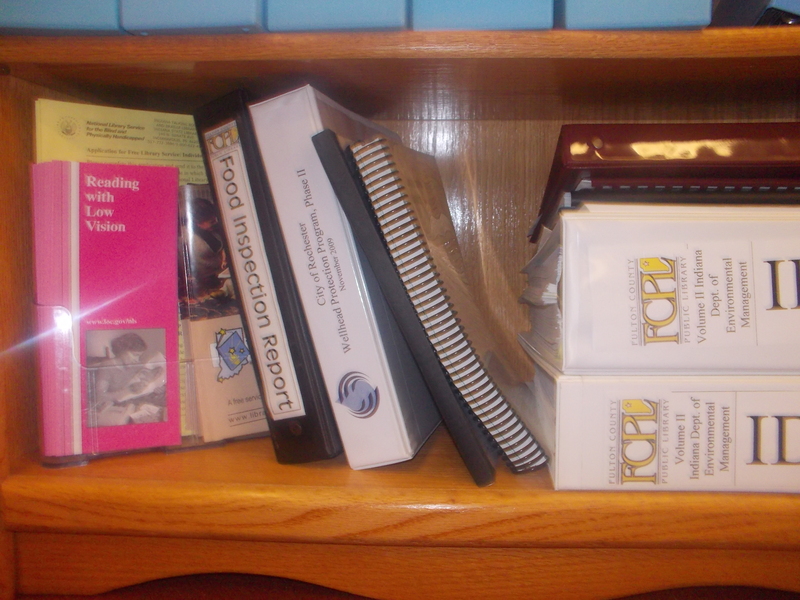 These books are all cataloged as Reference and must be used in the building. Just like the maps, they should be left on the tables after use for the staff to reshelve.